← Stop the Clock! I don’t want this dream to end! Years ago, when Chicago’s beloved Cardinal Bernardin was dying of pancreatic cancer, he wrote a book titled “The Gift of Peace.” The stories of his life were especially reflective because he knew that his health condition was terminal and that he had only a few months to enjoy his days left on earth. While he might have always been led by his faith, this book showed a spiritual readiness for what lie ahead. I remember closing the book, and crying for hours. I have only done that with one other book…”The Bridges of Madison County” and I still blame that one on hormones. As years have passed, I don’t remember many specifics from his life story, but I have always found comfort and pleasure in the way he described heaven. “As I conclude this book, I am both exhausted and exhilarated. Exhausted because the fatigue caused by the cancer is overwhelming. Exhilarated because I have finished a book that has been very important to me. As I write these final words, my heart is filled with joy. I am at peace. It is the first day of November, and fall is giving way to winter. Soon the trees will lose the vibrant colors of their leaves and snow will cover the ground. The earth will shut down, and people will race to and from their destinations bundled up for warmth. Chicago winters are harsh. It is a time of dying. But we know that spring will soon come with all its new life and wonder. It is quite clear that I will not be alive in the spring. But I will soon experience new life in a different way. Although I do not know what to expect in the afterlife, I do know that just as God has called me to serve him to the best of my ability throughout my life on earth, he is now calling me home. As soon as I get off the plane and onto Italian soil, I relate to these words and appreciate the comfort I feel in this beautiful place. I can’t think of any other way to share my feelings than to write a list of the things I love about Italy. So, in no particular order, here goes! I love the way people shop in small markets and seem to buy just the few things they need for the next day. As soon as I get to a new town, I scope out the shops for a place with fresh bread, fruit, veggies, and cheese. As I watch women leaving with a few carrots, tomatoes, a potato, and some greens, I can taste the soup I imagine they will make that night and want to follow them home for dinner. I love that cafes and coffee shops are extensions of homes. As I sit and linger, I watch people pass by, greet the server, and stand at the counter enjoying the daily routine of espresso drinking. There are moments when people hang around but cafes are one place where I see that Italians do not always linger. I love the way people are really affectionate and enthusiastic here. Very few people pass babies without a loud “Bellisimo” and cheek pinching; greetings are always big, mushy cheek kisses; people pass on the road with “Buon Giorno” greetings to strangers; and you should see what happens with couples who are in love. Mama mia! Not to be outdone by the older men, I love the older ladies, too. I look at them and see traces of my Gram and her sisters. Where else do you see women mopping sidewalks, cleaning up litter and picking dead leaves off of trees in public gardens, and yelling at children who are not their own when they get out of line? The “it takes a village” concept of raising children seems alive and well here in Italy. Once, I saw an old woman sitting in church watching as a small child was dancing near the altar while the parents stood by. After a few minutes of dirty looks, and obvious words of displeasure, she got out of her pew, picked the child up, and handed him back to his surprised parents. Nobody in church looked offended or upset, it was just the way it was going to be and those kids, who I believe were tourists, sat quietly for the rest of the mass, with eyes as big as saucers watching their new “Nonna” from a distance. I love the teeny, tiny cars that make my Mini Cooper look much too grandiose. The little Fiats and Smart Cars that line the streets are not only cute, but perfect for the tiny Amalfi roads. 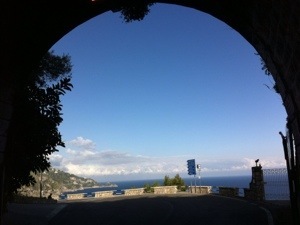 Speaking of Amalfi, I love the coastal highway. Although this area is overrun with tourists and in main cities, it seems hard to find a passing person who is actually Italian, it is still a beautiful place to visit. The twisty road hugs the coast from a distance high on cliffed edges. The colorful buildings and luscious blue water offer views that I have never seen anywhere else. I like to think that I am walking on a movie set and just wait for Sophia Loren to show up to perform her lines. I love the Italian language. I have taken a few daylong Italian classes, but really have difficulty remembering much. Sometimes, I think that is a good thing because instead of focusing on what people actually say, I am watching their facial expressions, rapidly moving hands, and passion for whatever they are sharing. The laughing, talking children are my favorite because their words sound like a mix of talking and singing. This probably goes without saying, but I love the food here! In the book “Eat Pray Love,” Elizabeth Gilbert describes how much time passes in Italy, based on her need to buy new clothes because of all the sumptuous food she enjoys in Italian restaurants. Sometimes, okay often, I eat when I am NOT hungry, just because I am walking past a pizzeria and the smell drags me in. Like yesterday, I had bread with my breakfast, a calzone by the beach, and a slice of pizza in the middle of the day. I love that the pasta is always served “al dente” and you are given just the right amount to enjoy. the sauces are fresh and light, but the noodles can be perfectly hard and heavy. I love the sparkling water that comes with meals. It makes me feel all elegant and grown up as I slowly take a few sips. I also can’t stop eating the fresh produce which is often sold from trucks along the street. My hotel room looks like a market with a dresser topped with strawberries, bananas, oranges, and apples. By the way, I also love that there are so many fresh things to eat here that taste better than home…the Parmesan cheese…balsamic vinegar, olive oil…all those things we consume in the States just taste more delicious in their hometowns. I love that people here move slowly and have down time in the middle of the day. Stores outside of tourist towns are often closed from 2:00-5:00 pm so people can eat a big meal and spend time resting with their families. The streets are virtually empty and up can hear sounds of cooking, and chatting (or yelling), and clanking silverware from the windows above. While there are likely kids on couches watching tv and playing video games just like at home, my imagination creates much more family-friendly scenes of shared meals and storytelling of days gone by. I recognize that I idealize Italy from the vantage point of a visitor, and that many things are much less perfect than I describe. That’s why, on this trip, I had the revelation that I will never move here because I don’t want to uncover those less that perfect realities. Instead, I choose to lovingly appreciate all that is good here and take pleasure in all of these things I love. This entry was posted in Italy, Travel and tagged Italy, Travel. Bookmark the permalink. 10 Responses to I Love Italian Things! Hi Nancy, if you would like to visit an organ factory or meet some really wonderful people please remember i have relatives in Cremona…kind of near Milan. The would love to have an American visitor! You will not be there in mid-July….you will be in my apartment organizing your clothes that have laid dormant for too long and are anxious to go home to a large closet. You will be there in mid-June. What would you do without old Aunt Bones tracking your every step???? Fantastic descriptions of all things Italian Nancy! So happy you are enjoying the small things and I’m oh so jealous!! Looking forward to your next post. Thanks! Good reminders here in Italy to slow down!!! See you soon! Your descriptions bring me back Nancy! I look forward to the days when we are working together and you share your love for reading, writing, and life. What amazing insights!